The photo is taken from the east looking west down Goodrich, and the railroad track and cars can be seen on the right just beyond the buildings. 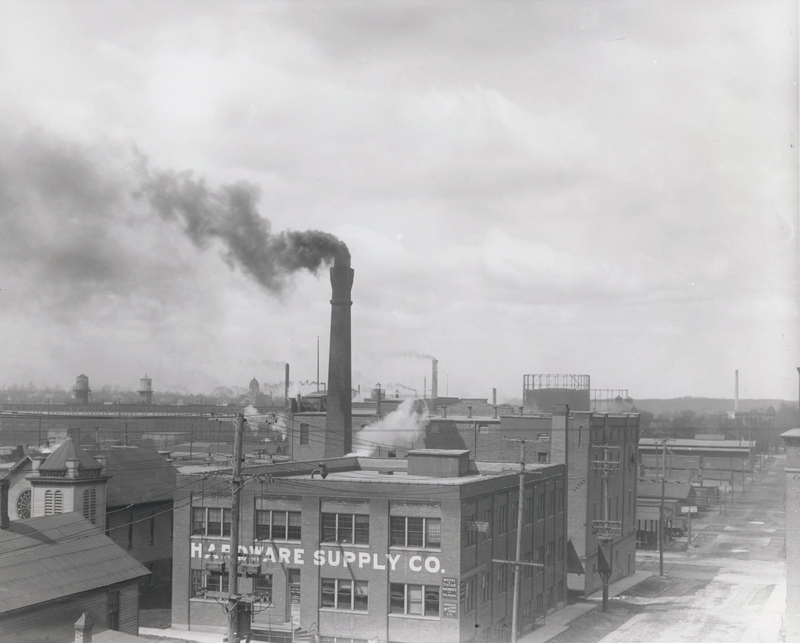 The brewry with its smoking stack is behind the Hardware Supply Co. To the left of Hardware Supply is the African Methodist Episcopal Arnett Chapel which was located on Spring St., now known as Commerce. At the far left, visible just above the chapel, is the long slim sign for the Sligh Furniture Co. Various unidentified smokestacks and towers can be seen in the distance. On the right, framed just above the horizon, are the outlines of the storage tanks at the Grand Rapids Gas Plant, also known as the Gas Works, located near the Grand River at Wealthy and Oakland. Title by cataloger. The Arnett Chapel was dedicated in June of 1899.